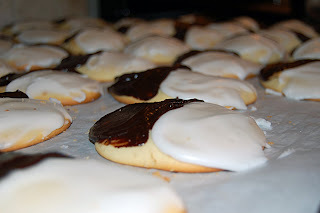 I have been wanting to make Black and White Cookies for a long time and since we had several “snow” days (really snow and ice days) a few weeks ago, it seemed like the perfect time. I used a recipe I found on smittenkitchen. It made quite a few cookies. Mine aren’t nearly as pretty as those on SK. 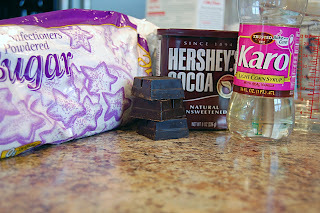 These are the ingredients for the cookie part. We’ll get to the icing later. I did wonder about using that lemon extract, but I had it on hand and it turned out to be very good – subtle. Cream the butter and sugar in a large mixing bowl. Add in the eggs, extracts, and milk. In a separate bowl combine the dry ingredients and then mix them in with the wet in batches. 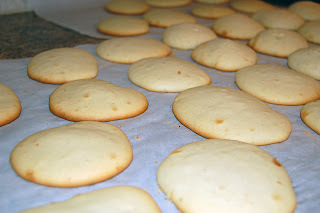 Use a spoon to drop the batter onto a baking stone or cookie sheets that have been sprayed with cooking spray. Bake at 375 degrees for 18-20 min. The cookies should spread out. The first couple batches of mine were too puffy and rounded so I stirred some milk into the batter to thin it. That helped them spread out in the oven and flatten a bit. Mine also didn’t turn out very round. I think one of those cool cookie scoops from Pampered Chef would help with that. I just used spoons. Boil a cup or so of water in a pan on the stove. Put the powdered sugar in a large, heat safe bowl and stir in enough of the boiling water to make a thick, spreadable mixture. 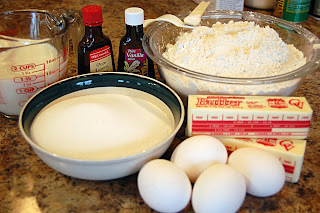 Be careful with the water – it’s easier to add water to thin it down than to add powdered sugar to thicken it back up. Spread the white frosting on half of all the cookies. Place the bowl over the pan of boiling water on the stove. 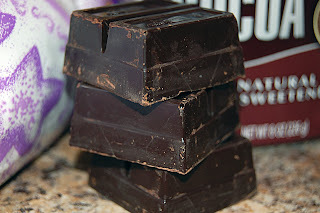 Add in the chocolate and corn syrup, stirring to melt. 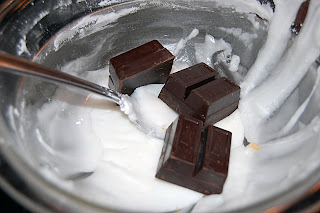 You can also add cocoa powder if you want the icing really black. I had to add some more boiling water to get this spreadable. 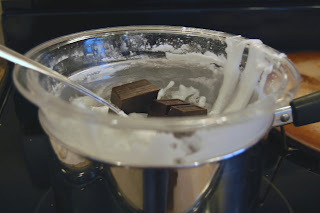 You’ve basically got a double boiler going here. Ice the other half of the cookies with the chocolate frosting. Yours will probably look prettier than mine. Decide which side to start eating, or just go straight down the middle. 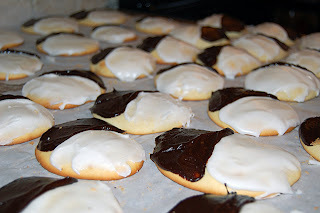 There’s still nothing like walking with your hubby down the sidewalks of NYC eating a black and white cookie together, but these were fun to make and they tasted great too. Cookies are my weakness! These look delicious!!! Thanks for posting on my giveaway. That’s neat that you did Usborne long ago. You did it the difficult way, with a baby. I am looking forward to when my kids are older because then the business will be so much easier! They’re like little tuxedo cookies! I love these type of cookies and I think you did a fabulous job. I love black and white cookies, they’re one of my favorites! I made them at home once without much luck. Stopping by from SITS! Thanks for visiting my blog! mmmmmm! Those look so tasty! I love cookies. I may have to try these out! These look so awesome. I will defintely give them a try. Ooh pretty! I’ll take one now. I came to follow you too, but I already was following…ha! Oh.. my .. GOSH!! These are my favorite cookies ever! We used to call them “half moon” cookies growing up in NY. Thanks for sharing the recipe.. and instructions! And thanks for stopping by earlier, I loved your comment.